I know that with a ling holiday weekend just around the corner that many will be taking to the roads. So, I wanted to take just a minute of your time to warn you of a little noticed and little understood danger that is lurking on the roadways all across our great nation. This is something that you have encountered numerous times on your drive to work or school or shopping, perhaps even today without ever giving it a second thought. It is a silent, stalking creature that moves slowly, almost imperceptibly along our road ways claiming everything that gets in its way. I am speaking of the ravenous creature know as araungicus barilis or more commonly called “orange barrels.” In the infant stage, this creature stands about two feet high and is cone shaped; as it matures it begins to reach a height of about feet and begins to round out so that it resembles a large orange barrel. These creatures often travel in large herds, usually in a single line formation that can stretch for miles. The adult barrels are usually seen in the middle of the herd with the cone-like children at the front and the back. Scientists believe that these creatures are migratory, going south in the winter and making their way north again as the weather warms. They appear to have a rather voracious appetite for asphalt leaving mile upon mile of road torn up and unusable. Once they have found a good place to graze, they seem to stay for months, barely moving as they silently feed only to disappear when the cold weather arrives. While these creatures appear harmless and almost stationary, they can be frightening when they attack, as evidenced by the almost universal presence of idle machinery along their path. We can only assume that they have either eaten, attacked or frightened off the workers who had used these machines in a vain attempt to protect the roads from the destructive force of this silent menace. Although they appear almost motionless while feeding, once they have consumed all the pavement in one area, they have the ability to travel quickly to another area where they can appear overnight to begin destroying another stretch of road. So be careful while you are out on the roads this Fourth or July weeekend. Those little cones and barrels along the road may appear still and harmless, but don’t let them fool you or you just might be their next victim. Drive safely! This entry was posted in Humor on July 1, 2014 by Leonard. Hilarious, Leonard. 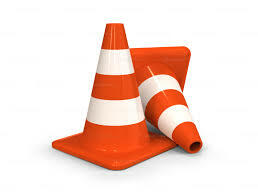 And, yes, the orange cone virus seems to have made it down here, too.